Some desserts will get on a kick ,the first attempt and we will make it over and over again. I prefer quick , simple and elegant dessert to impress my guests. And a perfect summer relish which is cool and creamy. The best thing about making trifle is that, everything can be done in advance. It is all about the layering of components, no matter what ingredients you use. It is the simple dessert recipe for a big party. It lets you look impressive without stressing you out. All you need is an elegant glass bowl which can display each layers. I prefer making trifle with the ingredients we actually want to eat. Bake your cake or get store bought cake, make pastry cream using whipping powder or whipping cream, blend together mango vanilla lime condensed milk and then layer one after the other. 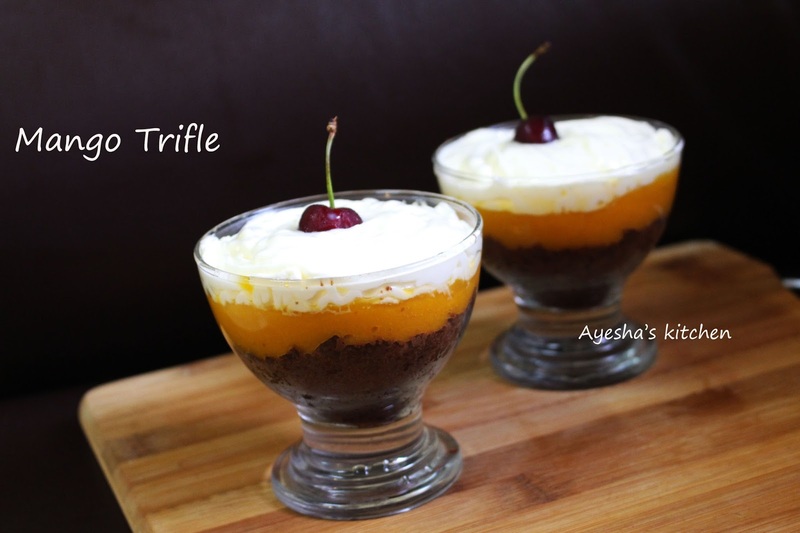 So lets see how to make easy dessert recipe with fruits / trifle recipe at home. Crumble the chocolate cake and set aside in a bowl or chill. Blend the chopped mangoes in blender along with condensed milk, sugar ,lime juice and vanilla essence. Chill it. Make the whipped cream. In a deep bowl, add the whipping powder (1 sachet), half a cup chilled milk, sugar (if required). Beat well until soft peaks are formed. (Keep the bowl, wire whiskers in freezer before whipping for best result). You can also prepare all these 3 components ahead of time and keep refrigerated . So that you can layer your trifle instantly and creatively. Or can impress your guest by giving them a chance to layer their own trifles. Now lets layer it.......Take 2 or 3 glass bowls.....add some cake crumbs in the bottom layer......Spread some chopped nuts......pour a layer of prepared mango- lime puree....drop some mango chunks.....top it with whipped cream ( use piping bags for designing)....garnish with cherry. Serve chilled. NOTE : You can also use chocolate sauce, strawberry sauce for garnishing and you can also repeat these layers again.